With the sun higher in the sky now, and noticeably more daylight even when it’s rainy, this seems like the ideal time to continue improving my vision, to nudge it forward from “good enough” to GREAT! With this in mind, I’ve resumed spending some time every night with the eye chart, the perfect tool to get me to focus on details, giving me instant feedback on how clearly I’m seeing. All day yesterday it was raining, so I hardly spent any time outside, which always helps my vision. Yet I was pleasantly surprised to see a lot of clarity on the chart, the letters crisp and very slightly bouncing in the Universal Swing. As I moved my chair back a few inches, then back again, most of the clarity remained — I could feel myself staying positive, not getting discouraged or feeling defeated that it was “too far to see” before I even looked. Even the chicken-scratchings in the lower few rows of the chart were perceptible! OK, I couldn’t decipher many of those letters, but I could definitely tell the difference between a letter and a white space. In the past the last few lines had only been a grayish smear, from much closer than this. I stayed at this for nearly a half-hour, scanning and visually tracing. I was hoping to totally let in and receive the clarity, to have my eyes and brain understand that this is normal sight, not a fluke. And I wondered, then and later, what was I doing right? 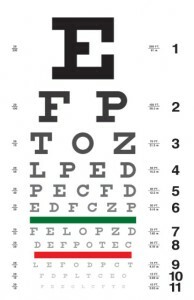 Why was this eye chart experience so much more satisfying than many of those in the past had been? 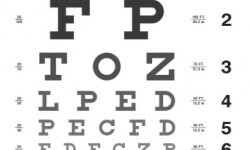 I wanted to learn from this, so I could continue to have clearer sight not just on the eye chart, but out in the world. The first thing that comes to mind is that I am no longer seeing the eye chart as The Enemy, the critical judge who will tell me I have poor vision. It’s just a measurement tool, like a tape measure to gauge my height. From some of the personal work I’ve done lately, I am feeling less judged by others (when they may not even be thinking about me! ), so I may have let go of some unconscious resistance, which of course is strain. I hope so! Even though it rained most of the day yesterday, when it slowed to a misty fog I did get out for a walk just before dark, which was right before I did the eye chart session. It was magical and peaceful in the mist with everything green and wet, which must have put me in a relaxed frame of mind. Also in the same time frame, I wrote to a cherished family member about something I’d been reluctant to tell her, something for which I was afraid I’d be judged. I was still worried about her reaction (which the next day turned out even better than I could have hoped), but I could feel the relief in myself when I sent the email about being able to be open with her. Even less strain! Earlier in the day I had reviewed a recent session with my EFT coach, and did some further tapping on my own. The issue we had worked on had to do with being welcomed and appreciated instead of judged and criticized, which now that I think of it, relates to the same issue with the family member I mentioned above. Freeing up even more emotional energy, from being defensive and guarded to being open and receptive! Yesterday was the first time in 4 days I did a weight workout, which I normally do every other day at least. I’d been feeling lethargic with really low energy which isn’t usual for me, that if I pushed myself too hard I’d get a cold. So it was finally time to work out again, and I could tell my body and my spirit appreciated it. I felt like the athlete I am, not like a lazy slug. More energy! Finally, my busy partner’s and my schedules miraculously coincided so we got to spend several hours together, which was a delight. He is my favorite company — I love it when we can have long uninterrupted conversations, and we had at least 3 of those today, a real treat. All this just tells me something I already know, yet apparently need to be reminded of periodically. If I’m relaxed in my body and mind and emotions, I’ll see better. It’s as simple as that. Could you relax a bit more, letting go of that strain you’ve been carrying, so you can function better too and fully enjoy your life?